Running a handmade business can become exhausting. Because you must make each product you sell, you really are earning all your money, as opposed to making money. Let’s look at that and why I think the concept may be helpful to your handmade business being more profitable. Earning money is when you put in time and you get paid for that time. If you spend an hour making a handbag, you get paid for that hour once you sell it. In order to continue selling handbags, you must continue to put the same amount of time in for each bag. This is why so many handmade business owners get burned out, especially around the holidays. For every item they sell, they’ve had to put the hours in to earn that sale. And it’s not just the hours spent making product. There’s packaging, photographing, listing online, setting up at a craft show, selling at a craft show, etc. Not to mention, many creators aren’t charging enough for their products, which means they’re not even getting paid for all of their time. Making money is when you put your time in to create one product (or service) and you’re able to make money off that product over and over, without much additional effort. It’s the concept of making money while you sleep. I also like to think of earning money vs. making money in terms of profits. Earned money is money you’re paid back for your time and expenses. If you spend two hours drafting, creating, marketing and selling an item and $10 on materials, when you make that $10 back, plus your hourly wage X 2, you’ve earned your money for that item. Let’s say $50 covers ALL your time and ALL expenses for a product and you’ve priced the item at $100. The first $50 you’ve earned. The second $50 is profit and puts you in the making money zone. Consider how much time you spend on your business in a week and how much you get paid from it. With each item you sell, you should be getting paid for the time it took you to make that product and any costs involved with making it…if you’re pricing your work properly. But what about the time you took to drive to the supply store, choose the proper materials, drive home, package or tag the finished product and the cost of that packaging or tag, snap a picture, download it to your computer, create a listing, etc. Are your profits covering those costs and your time? How much money is left over after you cover all expenses and time? The more you can increase the amount of money left over, the closer you move towards making your money, while less of it is earned. There will always be a level of “earning” your money. Even winning the lottery takes some effort. You still have to put in time and money to buy the ticket(s), check the numbers, collect the money, file your taxes, etc. But the money you make in relation to the money you earn, far outweighs the latter. The bigger chunk of your prices you can turn into profits, the more money you “make”. There are several ways you can boost the profits on each item you sell, as explained below. For more details on how to check your product’s profits and increase them, download the free sample chapter: MAKING PRODUCTS THAT PROFIT. When I started making handbags to sell at craft fairs, everything was one of a kind. No two bags were alike. Great for showing off my creativity but bad for making a profit. I had to come up with the design, draft a pattern, choose materials, purchase the hardware, take my time putting it together (since I was figuring out the steps as I went) and keep my fingers crossed that it turned out well enough to sell. Many new designs didn’t make the cut, which meant I didn’t get paid for any of my time. I didn’t earn or make any money. And then it came to my least favorite part; photographing the bags. Photography was not one of my strengths and became something I just wanted to hurry up and get done. I had to take a picture of every single bag, as well as measure the dimensions, look up fabric contents and write a description. It took the same amount of effort to sell each bag. Once I found my niche, I narrowed my selection down to: one really successful handbag offered in a few sizes and fabric options, a couple profitable staples and a few add-on items such as coin purses and wallets. I knew exactly which supplies to buy, the steps to follow and could churn out product much faster. I also only needed to photograph, write a description and list a product once, but could sell it over and over, since I made multiples of each bag. Instead of getting creative with every single product you make, get creative and dream up ideas a few times a year by creating product collections. Your creativity simply gets redirected into other areas of your business and you save yourself time and energy. 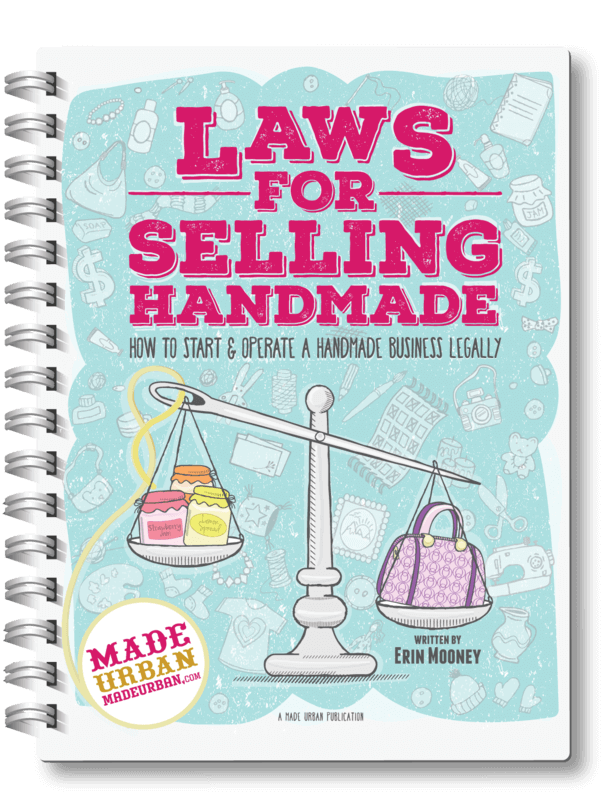 For simple instructions on how to create your product collections, download the FREE sample chapter from my ebook MAKE MORE MONEY AT CRAFT FAIRS. The free sample chapter not only covers the power of product collections and how you can create your own, it also explains in detail, how to make your products more profitable. As mentioned, you may not be accounting for all of the time you put into your business. I get that there are additional hours you must put into a startup that you don’t see back in dollars right away but if you’re running a business and are out of the startup phase, you need to be getting paid back for all your time and expenses. Start by tracking your hours, right down to the minutes. If you spend 5 minutes on your lunch break running to the post office to ship a package, track those 5 minutes. A small side business must fit work in when they can. Which means, the hours worked are broken up and often missed. It’s easy to lose track of the 5 minutes here and 10 minutes there…but they all add up. Anything you do for your business; reply to an email or sew on a button, write down the time you spent doing it. At the end of a month, add up all those hours and multiply them by the hourly wage you want to pay yourself. That’s how much money you should be getting paid for your time, through the sale of your products. The cost of your tools, price tags, office space and supplies need to be covered too right? There are fixed expenses that will be the same every month; for example, rent for your studio space. And there are variable expenses that may change from month to month. For example, you may have more or less expenses from month to month when it comes to craft show table fees or advertising costs. Would a big clothing brand say, “The warehouse we manufacture the clothes in costs us thousands of dollars each month. But that’s okay, we’ll just pay for it out of our own pockets.” No! They pay for those warehouse fees by factoring them into the price of each item they sell. If you’re simply basing the price of your product on how much the materials cost and how much time it takes you to make it, you’re essentially paying for the other costs of doing business, out of your own pocket. 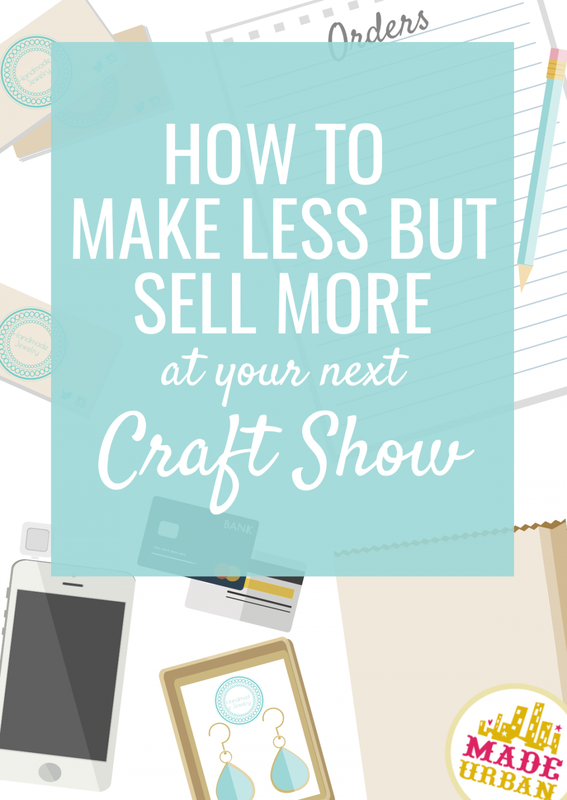 If you want to know what your overhead expenses might be and the 3 different ways you can cover them, download the free sample chapter from my ebook MAKE MORE MONEY AT CRAFT FAIRS. Decreasing the amount of OOAK products you make and focusing more on the best sellers you can create over and over, will drastically lessen the amount of time you spend creating, marketing and selling each product. That’s going to increase the profits on each item. You can also work on creating more of an assembly line. Although you’re still the worker at each station, when you break your manufacturing down into steps and complete one step for multiple products at a time, you become more focused, more efficient and can complete the step faster. Consider if there are any steps you can automate or hire out. But don’t go too crazy with this one, as you want to keep the handmade touch in your products. Hiring someone to cut all your pattern pieces, attach buttons or package your products may cost money upfront but save you time and money in the long run. Especially if a task slows you down and your time is better spent on a more profitable area of business. Another example is using a printer to create price tags instead of hand writing each one to speed things up. Constantly be looking for ways that you can buy your supplies for less or cut costs in your business. Stock up on materials when your supplier runs big promotions or use your business license to apply for a wholesale account at a supplier and get every purchase in a discount and buy in bulk whenever you can. Consider if you need that fancy studio space or if you can work out of your basement and write-off a portion of your mortgage, property taxes, heat, hydro, etc. Now we want to look at ways to make money that require very little of your time. These are items you can add to your product line up that are NOT made by you. The items you do create will still make up the bulk of your product offerings. However, you increase the money made vs. earned by adding a few items that improve the shopper’s buying experience, don’t require much more effort from you and give you a nice profit. Be able to buy the items wholesale or for a very low price that allows you to put a healthy markup on it, increasing your profits. Make the item a small part of your selection, especially if you’re selling at a craft show. You can’t show up to an event promoting handmade with a bunch of mass produced items. Your handmade items should be the focal point, while the items not made by you are a small add-on. Find an item that works with your handmade products; if you make jewelry, don’t start reselling mass-produced burp cloths at your table. There must be a connection between your handmade products and someone else’s you carry. To consider if this idea might work for your business, think about any items that might complete, compliment or help customers care for your handmade products. Is there anything your customers might need in order to start using/wearing/displaying/consuming your product? This idea is commonly used in toy stores. Most toys require batteries in order to function, therefor; a toy store may sell batteries as an add-on. An artist could offer frames to go with their prints and a picture hanging set that includes a set of nails and hooks. A candle maker could offer glass candleholders or decorative boxes of matches. A bath & body vendor could offer soap dishes to go with their soap, Epsom salts to go with their essential oil blends or a shaving brush and bowl to go with their shaving soap. What type of products might work well with your products? Customers don’t necessarily need these items to use/wear/display/consume your products but they would take them to the next level. Sort of like adding a “would you like fries with that” option; people don’t need fries to enjoy their burger and satisfy their hunger, but fries do compliment burgers nicely. Offering gift boxes, gift bags, gift wrapping or gift cards is a great addition for most handmade products, especially around a gift-giving season. A vendor selling knitted scarves or hats may offer broaches that can be pinned onto a beanie or infinity scarf. A vendor selling rings may be able to get a good price on vintage saucers or ceramic bowls and sell them as a ring storage option to their customers. People don’t often think about the importance of caring for their products until it’s brought to their attention. I don’t reach for the sprays when I buy a new pair of shoes until the cashier points out how one will help keep water and salt stains away in the winter. Protective travel or storage bags may be a good option for several types of products. A jewelry maker could offer a silver cleaner and polishing cloth for customers to clean their items and keep them from tarnishing. A leather or fabric spray could be offered with handbags to protect them and help them last longer. You can also take any of these ideas and sell them with your products as a set, as opposed to an add-on. It may encourage more people to buy multiple items, instead of just one, when they see everything neatly packaged together. For example, a soap vendor could bundle their lavender scented soap and hand cream with a soap dish, packaged in a nice box. It gets people thinking about gift giving, makes decisions easy and increases the sales per transaction, as well as profits. Add gift-wrapping and a gift tag to that order as an add-on to make the gift giving even easier for the shopper and to bump up those sales. This idea is similar to tactic #2 but instead of purchasing products at wholesale prices, you work with other business owners in your community. Is there another handmade vendor whose products compliment yours and who would be willing to pay you a commission if you sell their work? You could place a few of their products on your craft show table (or even add a page to your website to display them). You could have a consignment agreement with the other vendor, meaning you don’t pay them upfront for their products. If their items sell, you pay them the agreed percentage and keep a percentage of the sale for yourself. If the items don’t sell, you give them back to the vendor after the event or a set period of time. Less risk than purchasing an item you’re not sure will sell. If you’re offering someone else’s work at a craft show, be sure you run it by the organizer. It most likely won’t be an issue if you’re sticking to just a few items while your handmade products remain the focal point, but it’s always best to check first. This idea will work best if their products work well with yours. You can use similar ideas found under complete, compliment and care but look for a handmade vendor instead of a wholesaler. This option involves you putting in time and money initially but allows you to sell a product over and over, without putting in the same amount of effort over and over. This may not sound like a fit for a handmade business selling at a craft show or through online handmade marketplaces but it absolutely can be. It won’t work for every product but check out the examples below and consider if it may be used for yours. You do have to be careful with this one as you don’t want to remove too much of the handmade aspect from your business to the point you’re no longer eligible for handmade markets. A graphic design may be placed on a line of t-shirts, mugs, blankets, etc. If you’ve been making your products long enough or have prior training, you may be considered an expert at what you do. There are no doubt, other people who would love to learn how to make what you make and be willing to pay for your teachings. Consider if teaching a class is something you’d be interested in. No matter how many people you’re teaching a subject to, if you can get them all in one room, the amount of time you put in doesn’t greatly increase with each student and payment. If you price the class based on how much it costs to provide materials and your time to teach one student, any additional students you sign up for the class is money made instead of earned, minus the cost of materials for each student. Advertise and sell spots for a class at a craft show. Lots of crafty people shop at craft shows and may be interested in learning how to make an item instead of purchasing it. If speaking in front of a classroom isn’t for you, writing a book may be a better option if your writing skills are up to par. You can have your how-to book printed to sell print copies at the craft show or offer a digital option and sell it online as an ebook. If you don’t love writing, perhaps creating an online course is an option for you. Videos are a great way to teach people about a subject and are less nerve racking than teaching a classroom of people since you don’t have to be in front of a live audience and you can edit your presentation. Market your online course at a craft show and provide marketing material that directs shoppers to your website where they can sign up. Instead of investing your time to make each product, you can bundle together the materials required, print a set of detailed instructions and sell them together in a cute DIY kit. I’m sure you’ve had questions from craft show shoppers asking how you make an item (or overheard comments like: “I could make that”). Now you have a product to sell to the crafty shoppers who could make your products but likely won’t take the time to do it on their own. What do you think about those 5 tactics to help you make more money and spend less time earning it? Which ideas might you try in your handmade business? Question: I sell knitted scrubbies and dishcloths, which I would consider to be similar enough to fit under the same category. If I was to make an online store to sell them, would it be enough to simply make only those two products in lots of different colors and styles, or would it be better to add a few more products, things that still fit under the same general category? If so, what other things might be included under that category?